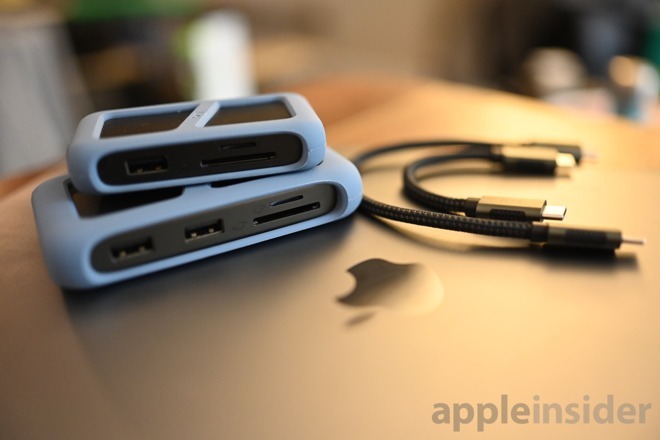 Of all the USB-C hubs and docks that have come out —even the ones designed to be portable —none have really embraced a rugged mindset. They also permanently affix the cable which makes it useless should it get damaged or if it is too short. That's why uniAccessories designed the uni Dock and uni Hub. A pair of USB-C accessories that fix those issues with impressive results. Both devices are fairly similar, but Hub is meant to be a more portable and compact solution while Dock is a more expansive solution with additional ports that may be better suited for on your desk. Starting with Hub, it is the smaller of the two. 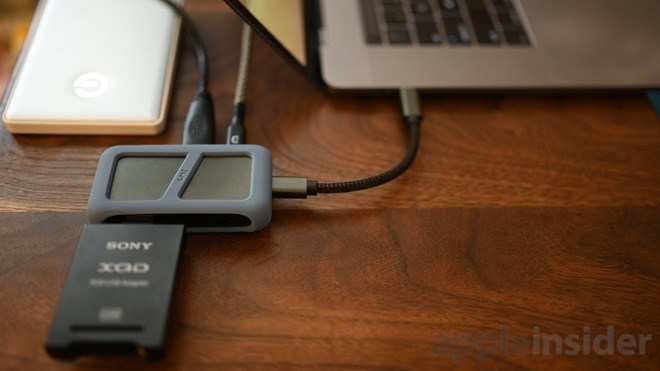 It sports two USB-A 3.0 ports, a HDMI port capable of 4K resolution at 30Hz, micro SD, SD, and a USB-C PD port alongside a USB-C output to connect to your Mac. That allows six devices —including a power cord —to be connected at once. 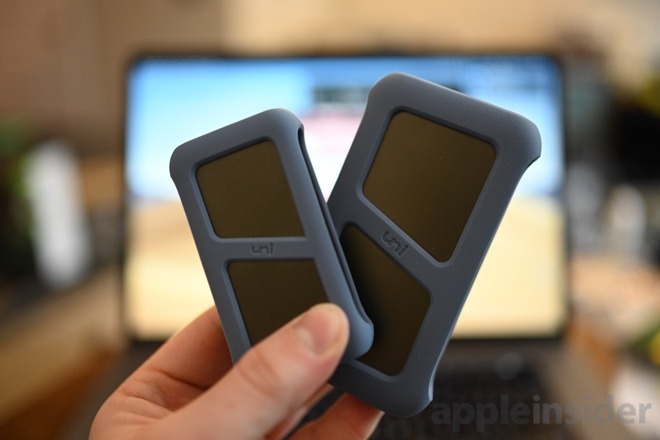 The size is perfect for tossing in a bag and features a silicone frame around the outside which is reminiscent of the LaCie Rugged drives. You can toss these around with them sustaining little to no damage, plus they are metal instead of cheaper plastic. 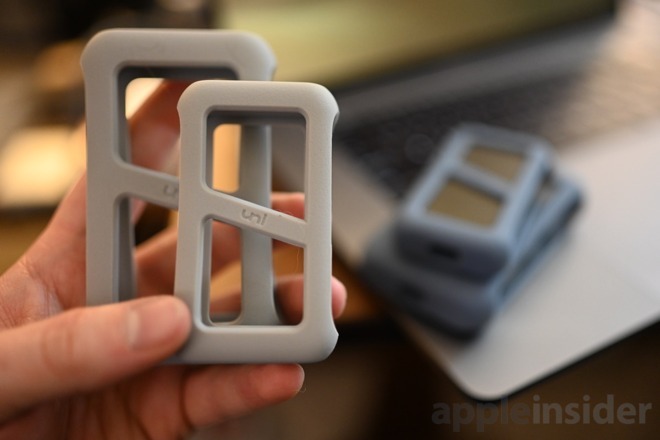 Those silicone exteriors are replaceable with different colors, of which two are available at launch; blue and gray. I connected my LG display and received no issue displaying 4K content. Gamers or others may want 60Hz, but for most 30Hz will be just fine. We also connected power, an SSD, and an HDD along with our micro SD card and got access to all of it without a hiccup. During our time testing both Hub and Dock, Hub was our favorite because of the portability and compact form factor. When working from our office, we relied on the uni Dock. It had less of a need to be so durable, but we still appreciated the design. Some of the smart design decisions are more obvious on the Dock than on the Hub. For instance, when looking at the ports, uni put the frequently accessed ports on the front, and the ones that get plugged/unplugged less frequently around back. It had Gigabit Ethernet, USB-A 3.0, HDMI 4K 30Hz, and the USB-C PD ports on the back. The front had two more USB 3.0 type A ports, micro SD, and SD ports on the front. This makes sense because SD and micro SD cards are frequently taken in and out, as are the USB-A ports. Unfortunately, there were no extra USB-C ports on the larger hub, which we'd have preferred. On both Hub and Dock, the USB-C port that is available is only useable for Power Delivery and not any sort of data transfer. This means you can't connect USB-C devices directly to the hub. On our 15-inch MacBook Pro we have three other ports we can use, but for thos on a smaller machine this may be a big issue. This still is only a USB-C dock versus Thunderbolt 3 that relies on the same type connector. If you are looking for additional I/O or faster transfer speeds, you can check out the AppleInsider guide on Thunderbolt 3 docks. There are still a ton of accessories that need connected to your Mac that aren't USB-C. Storage devices, printers, displays, and much more that we don't necessarily want to replace off the bat. USB-C hubs are a great way to expand that I/O and be prepared for anything. 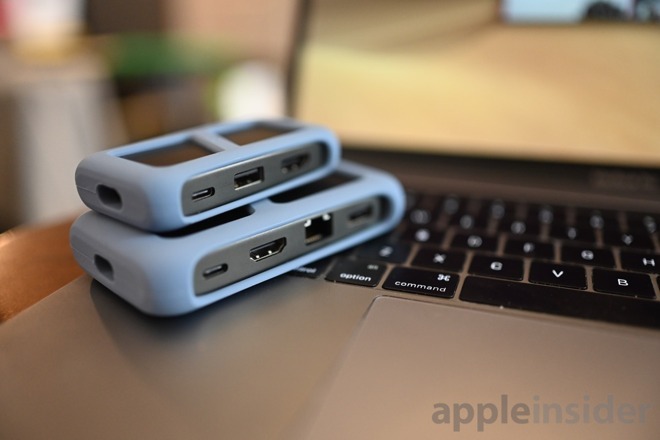 Both Dock and Hub worked exactly as expected, keep useful ports on the front, have swappable USB-C cables of different lengths, are thoroughly rugged, and overall just look cool. We've kept other USB-C hubs with us for on the go in the past, but none have made as much an impression as this pair from uni. Currently, uni is taking preorders for Hub and Dock on Kickstarter. At time of publication, the campaign has more than quadrupled its original goal. Hub is available for early backers at $39 and Dock is available for $55. As a reminder, this is a Kickstarter offers no guarantee they will deliver. They are an established brand, however, which does give them more clout. We also got our hands on the devices themselves to verify their veracity.